That means more supernovae, black holes, and a new model of star formation. For fans of drama, the Universe can be a bit of a disappointment. Most of the stars it currently produces are red M-dwarfs. With masses less than half that of the Sun, these will burn fuel contentedly for trillions of years and then gradually fade. Massive stars, with 10 or more times the material found in the Sun, will explode and possibly leave an exotic object like a black hole behind. But they're relative rarities in the present Universe. Or so we thought. A new survey of a star-forming region adjacent to the Milky Way has found an excess of stars with 30 or more times the mass of the Sun—and an even larger excess above 60 times the mass of the Sun. The find suggests that we could see a lot more supernovae and black holes. And it also implies that there might be something fundamentally off about our models of star formation. Stars form from a mix of gas and other material that are drawn together by gravity. But things like angular momentum and the heat of friction fight against the pull of gravity. Star formation ends up being a balancing act, with limits on the amount of material that can accumulate before the star ignites in fusion. Once that happens, the heat and light of the star will drive off any material it hasn't already ingested. Overall, this makes smaller stars a more probable outcome in the present-day Universe (the physics were somewhat different early in the Universe's history, when there was little more than dense clouds of hydrogen around). So, if you survey a large-enough portion of the galaxy and then plot the number of stars against their masses, you should see a steady decline in number as the mass goes up. Simulations of star formation have allowed us to estimate the rate of that decline. Implicit in all of this is that the slope will eventually hit zero at some mass. Above this point, forming a star through this mechanism should no longer be possible. This seems to work out in the nearby galaxy, but there have been hints that it doesn't hold up in areas of intense star formation. Most of those are found at great distances, where the young Universe frequently saw periods of intense star formation, creating what are called "starburst galaxies." There is, however, one example relatively close by. The Large Magellanic Cloud, a small satellite galaxy that orbits the Milky Way, contains a region called 30 Doradus. 30 Doradus has a large number of young stars, including many very large ones—possibly including the largest star ever observed. So a large team of astronomers decided to analyze data from 30 Doradus that had been obtained by a survey done using the Very Large Telescope. The work focused on the spectral properties of stars that could be resolved individually, as analysis of binary stars can be difficult, since you don't know how much either star is contributing. The spectral information was used to estimate the age and the size of the stars. And it turned out a lot of the stars were big. Of the 452 stars the astronomers were able to observe, 247 were bigger than 15 solar masses, which means that all of them are fated to explode in a supernova. Overall, this data favors a slower decline in frequency with mass—there seem to be more really big stars than our models suggest. Because of this, the maximum mass of stars formed in 30 Doradus isn't as low as we'd expected. The expectation has been that 150 solar masses would be the upper limit, but the researchers found one that's more than 200 solar masses (other researchers have claimed a star in the area is about 300 solar masses). And their data can only rule out stars of 500 solar masses with a 90-percent confidence. 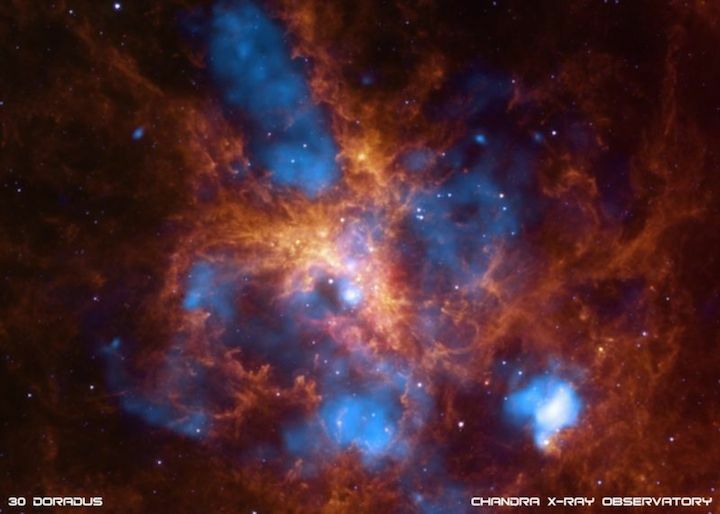 This doesn't mean that the numbers in 30 Doradus are typical of the galaxy as a whole, as starburst events involve a distinct set of conditions from that typically found in mature galaxies like the Milky Way. It's not even clear that it's typical of other starburst regions, given that this is the first we've gotten a good look at. But if it is, then there should be a lot more very massive stars out there than we thought. On a basic level, that means that our models of star formation are incomplete and don't successfully account for the conditions of a starburst event. But it also means our expectations for the rate of various phenomena could be way off. Supernovae would occur 70 percent more often than we thought and be producing three times as much metal. Black hole collisions, which we've only just detected, should be occurring at 2.8 times what we'd previously estimated. These numbers have a very large experimental error, so they're consistent with a large range of values. But, as our ability to detect transient events and gravitational waves increase, we can start putting some limits on the frequency of these sorts of events.